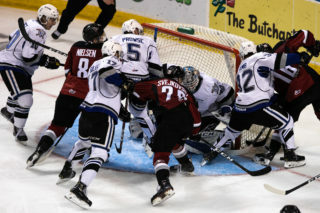 Royals lose 7-3 to Portland; re-match goes tomorrow night. 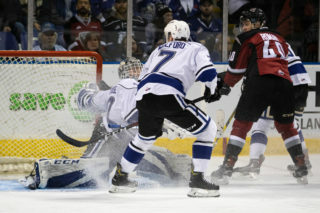 Portland, OR – The Victoria Royals were beaten 7-3 by the Portland Winterhawks on Friday night at The Moda Center. 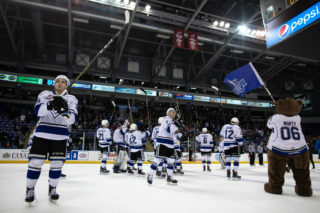 Royals – Kaid Oliver 2g-0a, D-Jay Jerome 1g-1a, Scott Walford 0g-1a, Brandon Cutler 0g-1a, Tarun Fizer 0g-1a. Portland – Cody Glass 1g-3a, Ryan Hughes 1g-1a (Game Winner), Joachim Blichfeld 1g-1a, Jared Freadrich 1g-0a, Brendan De Jong 1g-0a, Reece Newkirk 1g-0a, Haydn Delorme 1g-0a, Clay Hanus 0g-1a, Lane Gilliss 0g-1a, Jake Gricius 0g-1a, Michal Kvasnica 0g-1a, Nick Perna 0g-1a. 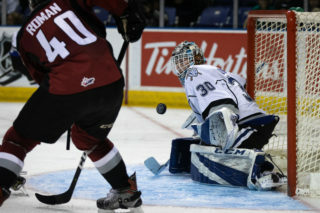 Royals – Griffen Outhouse (L) – 56:03 mins, 21 saves on 27 shots. Portland – Shane Farkas (W) – 60:00 mins, 18 saves on 21 shots. Power Play Precision: With a powerplay goal in tonight’s game, the Royals have now scored at least one man-advantage marker in each of their three road games this season. In those contests Victoria is 5/13=38.5%, which is the best road powerplay mark in the WHL. Putting up Points: With two goals tonight, Royals’ forward Kaid Oliver extended his point streak to five games. During his point scoring streak, Oliver has recorded nine points (6g-3a). He currently leads the team in both points (18) and goals (11) through 13 games this season. 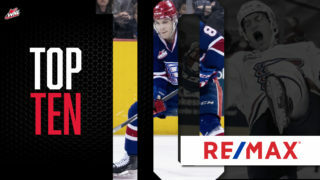 Familiar Face: In tonight’s contest, Portland’s 20-year-old defenceman, Jared Freadrich played against his former team for the first time since he was traded from Victoria in May of this year. In his lone season with the Royals, Freadrich recorded 32 points (12g-20a) in 71 games with the club. 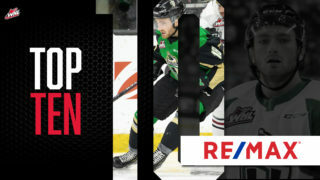 Homegrown Talent: Defenceman Brendan De Jong of the Portland Winterhawks was born and raised in Victoria BC. The defender grew up playing for the Juan de Fuca Grizzlies in the Vancouver Island Bantam Hockey League (VIBHL) in 2012-13 and the Saanich Braves of the Vancouver Island Junior Hockey League (VIJHL) in 2013-14. Coming Up: The Royals finish their two-game road trip against the Portland Winterhawks tomorrow night at 6:00 p.m. Victoria’s next home game is on Friday, November 9th vs the Spokane Chiefs. Tickets can be purchased in person at the Select Your Tickets box office, over the phone by calling 250-220-7777, or online at www.selectyourtickets.com.